These kittens have the hearts of lions! Now I see why Katy Perry's spirit animal is a cat. 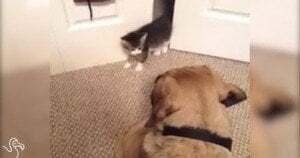 These little kittens are fearless and teaching these big ol' dogs a thing or two!